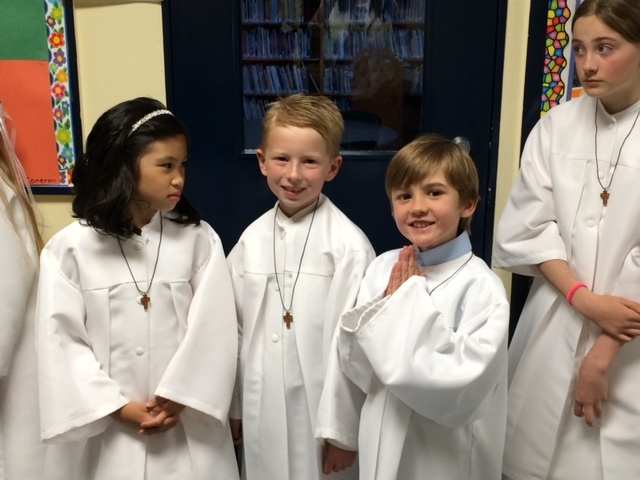 After many months of preparation, the Grade Two class received their First Holy Communion on Sunday May 3rd. First Holy Communion is considered one of the holiest and most important occasions in our lives – it is a significant milestone in the life of a Catholic. It is the first time that we receive the Sacrament of the Holy Eucharist, which is the eating of consecrated bread and drinking of consecrated wine. Everyone was excited about receiving this special gift from Jesus. Here’s what a few students had to say about their Holy day. Family and friends joined us in celebrating – even from as far a field as Germany. Thank you to all the wonderful Grade One and Three families who planned and hosted the lovely, delicious reception in the gym afterwards.